Choose one of our top flavors, one of your favorites, and your box wrap! Don't forget your free message. Quick pick! If you want a box of our other cookie flavors, just go to "Single Flavor" or order under "Create Your Own" Categories. Chocolate Chip: The big kahuna, the grand slam, the most incredible chocolate chip cookie you will ever taste. This cookie, baked with our signature dough and secret ingredients, is the one to stand the test of time. Yummy to the last bite. You have voted best cookie in over ten cities. Cinnamon Delight (Snickerdoodle): Our sugar cookie, infused with cinnamon and spice that has a profile that’s light and airy with great flavor. A favorite for many! Snicker-snap-snicker-doodle. This light and delicious cookie, coated with pure cinnamon, is a "Sinful" creation! Oatmeal Raisin: Just an old fashion oatmeal raisin cookie that brings back the beautiful memories of home! White Chocolate Chip: Guittard white chocolates replace the semi-sweet and become the centerpiece for this light, creamy, and tasty cookies. White Chocolate Macadamia: Our signature cookie! White chocolate with Macadamia Nuts flown in from Hawaii. 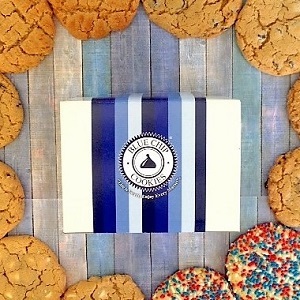 Our cookies made with the finest ingredients: real sweet butter, pure vanilla, macadamia nuts from Hawaii, specially milled flour, cane sugar, and whole eggs. We have no trans fats and no preservatives. We will ship Thursday for Friday/Saturday delivery only. If Thursday ship is not available, please feel free to call us, and we will try to accommodate. Freeze for the Future: If you cannot eat all your cookies within two days we recommend you leave them in the bag and freeze! Do not refrigerate as this will dry the cookies out. Take your cookies out of the freezer 15-20 minutes before serving to defrost. Also, you can put them in the microwave for up to 12 seconds to enjoy them warm and "oven fresh!" Nut Allergy Notice: Due to our cookie baking and handling process, all our products and bakers, packaging team may come in contact with tree nuts or nut oils. Please be aware of this if you have any allergic reaction to these products. All products have major food allergens (wheat, milk, soy, eggs) and bake with exposure to Tree Nuts/Peanuts.